I love breakfast foods, but I also love my sleep. If the decision is between 15 minutes of breakfast or 15 of sleep, it’s usually a pretty done deal that I’ll go for the latter. My bed is just so warm and cosy that not much stands a chance against it, so I’ll usually be the one dashing out the door, water bottle in one hand and a packed breakfast in the other. That’s why I love the ease of this high protein breakfast, as all-in-all it takes about 5 minutes to make, is high in protein and healthy fats, and just keeps me feeling satisfied until lunch. If you’re extra pressed for time, you can always make it in the morning and pack it in a tupperware to have at work. Chances are the eggs will probably still be warm when you eat it! Another reason I love this, besides it’s convenience and speed (and minimal washing up), is because it’s important for me to start my day with a high protein breakfast instead of a purely carb-y one. Nothing wrong with carbs, I do love them, but if I haven’t really workout out in the morning or done something more chilled out like yoga, then I focus on protein and fats with a smaller dose of carbs as it’s what makes my body happier and keeps me from reaching for that pick-me-up snack before lunchtime. Also, we all know eggs and avocado is a pretty fail-proof combination! 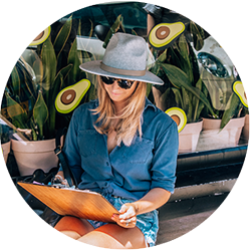 Just head to Pinterest for eggs and avocado and you’ll be flooded with ideas. Place a frying pan on medium-high heat and melt your ghee or butter. Crack in your eggs, being careful not to break the yolks. Sprinkle over some salt and pepper, and place a lid or plate over the pan and reduce the heat to medium. Cook for about 2 minutes, until the whites are set but the yolks are still runny. 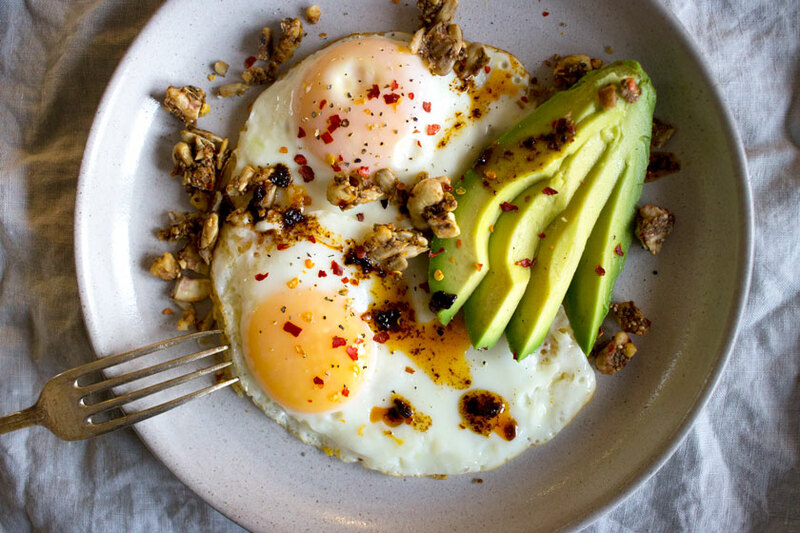 Plate up with the avocado and sprinkle over the savoury sriracha granola clusters. Mix together the olive oil, garlic, and chilli paste and drizzle over, then tuck in and enjoy! *Recipe coming, or if you live in the UK I recommend this one from Superfoodio! Hey Buddy!, I found this information for you: "My Go-To 5-Minute High Protein Breakfast". Here is the website link: https://www.sprinkleofgreen.com/my-go-to-5-minute-high-protein-breakfast. Thank you.